Jersey will play their first match for nine months when they host the Royal Navy on 18 March. The game will be the first since Martin Cassidy was appointed manager of the island side in July following Brian Little's decision to step down. The game at Springfield kicks off at 17:00 GMT, with Jersey's women facing the Navy earlier in the day along with the under-18's Muratti with Guernsey. "It's a game that I'm looking forward to," Cassidy told BBC Sport. "We've done a lot of planning and preparing and it's now about getting the players in for training around mid-February." 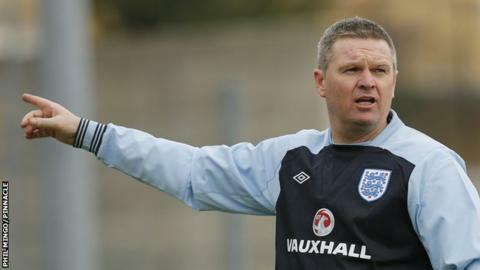 Cassidy was in charge of Jersey on a temporary basis in their last game, a 1-1 draw with Scottish League Two side Clyde in June, but has had to wait after two planned friendlies in France last summer were postponed. The game is a week before the Muratti semi-final in Alderney, which will be Cassidy's first competitive game in charge ahead of an expected Muratti final against Guernsey in May and the Island Games in Gotland in June. "I've seen more than 25 games across the Premiership and Championship to get an understanding of the players I want to get together," added Cassidy. "The players I want are keen to play for Jersey, so I'm looking forward to getting a good squad onto the pitch." Jersey submitted a bid to leave the English FA and join Uefa in December 2015, following the acceptance of Gibraltar and Kosovo, who are not independent nations. But Uefa rejected their application - a decision which the island is currently appealing through the Court of Arbitration for Sport.